Don't get me wrong: I like Twitter. I'm not a slobbering obsessive who wants to marry Twitter and give birth to a bunch of little matt-inman-tweetlet-bird-babies, but generally speaking I like it. I've used a few Twitter clients for both the iPhone and desktop, but most of the time my interaction with the community occurs on the twitter.com website. These are 3 minor fixes that I believe would make the website substantially less painful to use. 1. If I receive a new reply or direct message, show it in the sidebar - don't require me to click through and refresh that entire page. This wastes my time and requires another hefty page load from your server. Also, showing the total number of direct messages in the sidebar is useless, instead show the number of new messages. 2. Highlight replies to me in the list of tweets. 3. Autocomplete twitter usernames when I'm replying. Sometimes when I want to tweet @someone I can't recall their exact twitter username. I either have to google them or scroll through all my followers to figure it out. You should add an auto-completing search box similar to facebook. Simple, right? I'm not asking for a massive overhaul of the site, just a few minor tweaks. Rails is agile, and I know you guys at twitter are super clever, so get to it! I'm not one to ask for free work, however, so in exchange for these fixes I'm offering you something priceless: a new mascot. The little bird isn't cutting it anymore, so I've taken the liberty of drawing you a new character to represent your website. 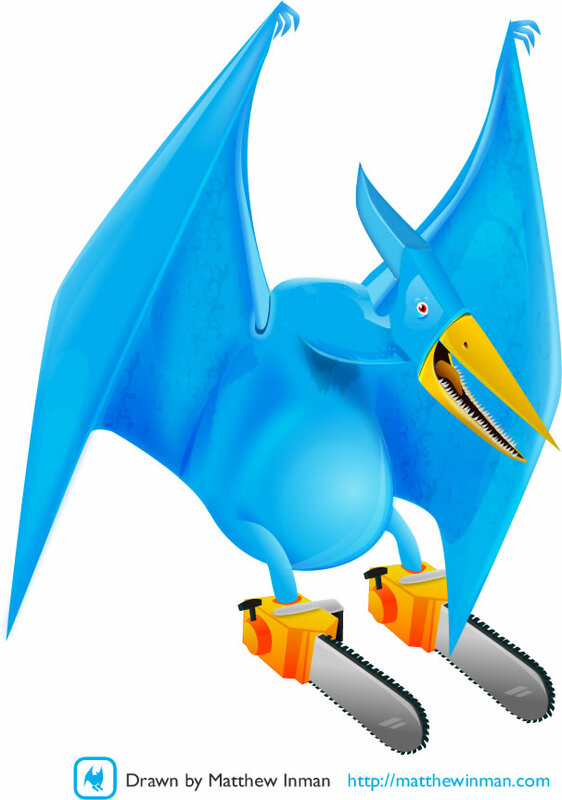 What better animal to embody the spirit of Twitter than a pterodactyl with chainsaws for feet? Sweet, holy Hammond that is a terrifying creature. Now, if only he was swooping from above on the precipice of attacking the Fail Whale.. I hear the whale's one vulnerability is chainsaw feet. Brilliant suggestions. I'm on board with all of the above. I think a Chainsaw Pterodactyl mascot would give Twitter the street cred it so desperately needs. Fail Whale will all but be forgotten. whats terrifying are those killer teeth, kind of like an aligator gar's.. you should do one of those next..
brilliant! love the suggestions... AND the mascot! Totally agree. I would add "Put the search box somewhere massively obvious." I use it so much I've bookmarked the search page. In fact it's the only way to find those pesky twitter handles you can't quite remember. One more about DMs. They are hiding. Why not also present DMs in the main stream as they arrive, like many other clients do. Keep the current tab. There's a Greasemonkey script for autocompleting usernames. Works great. These are good suggestions but most of the are taken care of by the vast majority of Twitter clients out there. I honestly wonder why anyone would even use the actual Twitter website with so many handy options out there. I think Twitter's strength is still in its simplicity. It's failings are taken care of by the plethora of 3rd party apps out there thanks to it's rather liberal API. Apps like http://twitterless.com take care of a lot of missing features. 2. Uh - have you tried /replies? 3. On the web UI, when you hover over a tweet, a "reply" arrow appears in the lower-right of that tweet. Click it and @username shows up in the tweet box. I absolutely agree 100% - I've always thought the auto complete would be great, and your other suggestions are sensible ones too. Tiwtter is Da Bomb, leave them alone already! Great suggestions. I've emailed them about #2 a few times now...frustrating. Only used twitter for about 2 weeks now but your comments are on the money. Ive got three direct messages that I still havent figured out how to drop/keep from showing up on the web client. Like the mascot but the chainsaw for feet is just weird/creepy how about regular talons grabbing a pair of running chainsaws - now that woul be badass. Great suggestions, and you're right, they aren't to much to ask. Have you gotten any response/feedback from Twitter? Number 1 - would be good for users, but by not doing this it increases their page views, which is good for them when they start taking ads. When you click the 'reply' button to a tweet that is *not* someone's most recent tweet, it should record exactly which Tweet you are replying to and make the 'in reply to' link point to the correct place. i agree, we should definitely implement the pterodactyl with chainsaw feet. great suggestions. and i agree w/ a commenter above, i would like to see that beast of terror attacking the fail whale! Great suggestions. I would say the auto-completion of Twitter usernames would be the most important. I always mistype usernames and it's too clunky to look them up. The only problem I see with the new count is that it's tough to determine if you've read them or not. I really like the idea of highlighting replies and auto-completing usernames though. You might try adding those to Twitter's GetSatisfaction page to see if anyone backs you up on them. Hey is it just me, or is that pterodactyl violating some major laws. of perspective. But it immediately threw me off. Anyways, i found this interesting site. Why don't you check on it. I agree with the highlighting the @replies that you receive, it's a feature on Twinkle for iPhone but I'd love to see it on the actual Twitter website. Like I replied to you on twitter... love it, and completely agree. Mind if we use that logo you made? I love it!! I suggest adding some sort of ability to use anchor text or even just a characer like ">" to insert links, instead of having URLs take away from the 140 character limit. that first one is genius. PLEASE PLEASE PLEASE give us a sidebar! Would you say twitter FAIL? And a whole domain for fail hate? Too funny! 4. Add a feed only for people on toilets and call it Shitter. I agree! Especially the DM System freaks me out. And the new "bird" is great! I love it. I'm kind of scared of Pterodactyl, LOL. Can we keep the Twitter birdie please? He's both polite and powerful (not), LOL. I just don't want Pterodactyl! I would like to add: please develop a way for us to sort our follower list. It takes me a long time to find a particular follower because they're in no particular order. It would also be nice to sort them by location, keyword, etc. 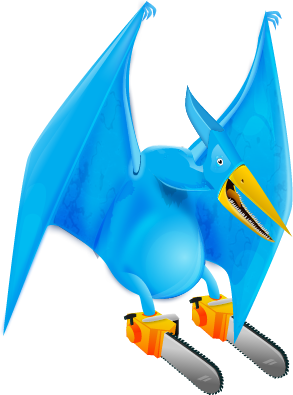 The mascot is drawn faultily; the left wing of the pterodactyl should not be hiding the left foot (chainsaw); please correct this if you want twitter to really take you seriously -- otherwise you seem to be someone who only wants to make a point, not a gift! Ardel - It was neat seeing this joke fly over your head at supersonic speeds. If this happened. twitter would be perfect. Another thing that would be useful is to be able to search through your own tweets by keyword or date. I've alway wondered what my first tweet was but over 2500 tweets later, I may never know.